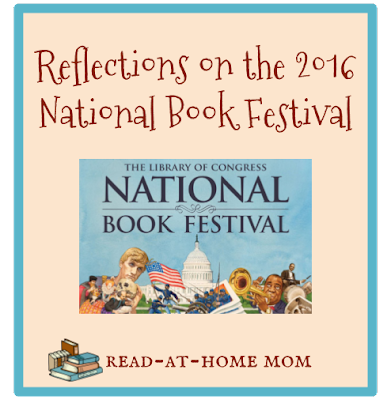 On September 24th, I took a mom's day out and went alone all day to the National Book Festival at the Walter E. Washington Convention Center in Washington, D.C., which is about a thirty minute Metro ride from where I live. Over the course of the day, I saw eight different presentations from children's authors. These are my reflections on each of those sessions. I first saw Calvin Trillin at the New Yorker Festival when I was a teenager. My father always liked his writing, and he really wanted to see him speak, so I tagged along. Trillin's deadpan sense of humor won over both of us, and we still frequently talk about that day, and repeat some of the stories he told. So when I saw that Trillin would be at the National Book Festival to promote his new collection of children's poetry, I knew I wanted the chance to see him again. Though he is clearly 20 years older now, that was about the only change I noticed. He was laugh-out-loud funny, even though a couple of jokes flopped, and despite accusations of "casual racism" in one his poems a few months ago, he does not seem to have censored himself at all. I think I was the only 30-something-year-old in the audience - most seemed to be people in their 50s and 60s - but I really enjoyed his talk and was not at all disappointed. Of all the authors I saw, these creators of Click Clack Moo and its sequels were the ones I would most want to hire for a school visit. They were the only presenters I saw who tailored their presentation toward the kids in the audience, and they made a great team. Doreen Cronin is not at all what I imagined. In fact, before they introduced themselves, I actually mistook them for each other, but Cronin turns out to be a Long Islander with no farm experience, while Lewin is quite familiar with farms. As part of the presentation, Lewin took requests for non-farm animals from the kids and drew them on the spot, which is something I always loved as a kid. Of all the presenters I saw, these two seemed the most comfortable on stage and the least obviously rehearsed. There was a technical glitch at the start of Melissa Sweet's talk about her new kids' biography of E.B. White, and it seemed to throw her off her game a bit. She seemed very nervous and spoke quickly, as though just trying to get through the presentation, and she didn't really seem to want to engage with the audience in any way. The visuals in her Powerpoint presentation were gorgeous, but there were too many, and she ran out of time to get to them all. I left wanting to read her book, but I just felt uncomfortable throughout the whole presentation, like I wanted to jump up there and save her. I was curious about Aaron Becker after reading the third title of the Journey trilogy, and I was really hoping to hear more about his thought process as he created these wordless titles. He did touch on his vision a little bit as he "read" Journey to us, but then he also seemed to run out of time before he could say all that he wanted. Since I'd already read Return, I was kind of disappointed that the whole presentation was basically a teaser for it, but the presenters do come to the festival to promote their books, so I don't think I can really blame him for that. Like Cronin and Lewin he was very comfortable on stage and seemed interested in engaging kids - and encouraging them in their art. I really wanted to see Raymond Arroyo because of his new middle grade book, Will Wilder: The Relic of Perilous Falls. The supernatural elements of this adventure story are all connected to actual relics of real saints, and though the writing isn't really that great, I was thrilled to know that a novel inspired by the Catholic faith was being published by a mainstream publisher. Therefore, I was really disappointed when two people in a row asked Arroyo about the connection between his faith and his book and he just flat-out denied that there was one. I can't tell if he truly doesn't believe there is a connection, or if he has decided to downplay those elements to reach a wider audience, but I felt let down either way. He is the only author I know of with any kind of platform to represent Catholic values in mainstream fiction, and in my opinion, he blew it. I couldn't help but wonder if his answer to those questions would have been different during a visit to a Catholic school. Sophie Blackall was the absolute highlight of the day for me. Her presentation about Finding Winnie was well-organized, engaging, and even emotional at times. She shared a lot about the process she underwent in order to create the artwork for the book, and she also talked about her personal relationship to the Winnie-the-Pooh stories. I have always loved her artwork, but knew very little about her as a person, other than that she is Australian, so it was so nice to put a personality to the name, and it was wonderful to discover that she is just so lovely. I also appreciated the fact that she included A Fine Dessert in the portion of her slideshow where she spoke about her other books. After all the controversy surrounding that title, she could have chosen to leave it out, but I admired the fact that she stood by her work and didn't disown it. I would absolutely want to see Sophie Blackall again - and I'm definitely going to read Finding Winnie now! Jo Knowles was the only "teen" author I went to see, and I chose to do so only because she was talking about a middle grade novel, Still a Work in Progress. She told a great story about the influence of Robert Cormier and The Chocolate War on her writing career, which was fabulous, and would make wonderful school visit material, but toward the end, she became sort of overwrought about diversity issues, especially when it comes to getting LGBT books into the schools. Since she was mostly preaching to the choir, it just felt uncomfortable to watch her getting so emotional, even though it was clear she strongly believed in what she was saying. I want to read The Chocolate War now, though, so that's something. The final session I attended was an hour-long evening panel about turning kids' books into movies. The guests were Katherine Paterson and her son, who have adapted The Great Gilly Hopkins for the big screen, and Patrick Ness, who developed his own book A Monster Calls, into a screenplay, and then a film. I went solely because I wanted to see Katherine Paterson, and to find out more about the Gilly Hopkins film, but I ended up being really intrigued by Patrick Ness. We did get to see clips from both movies, which was great, but I really just loved hearing Patrick Ness talk about writing - and shutting down a ridiculous question from the audience, to boot. Ness doesn't write anything that I would ordinarily consider reading, but hearing him speak really made me want to give one of his books a try. Overall, this was a great experience. I'm not sure I'd want to do it every year, but if there was another great collection of authors like this, I would absolutely go back next year. It was nice to just be immersed in a world of books and authors for the day, and to blend into the crowd and enjoy what they had to say.